In past years, I’ve been critical of making New Year’s Resolutions, using the logic that January 1st is an arbitrary date, nor should society tell us when to improve our lives; furthermore, this capricious nature of New Year’s Resolutions leaves us susceptible to failure. People aren’t motivated to begin with; indeed, New Year’s Resolutions are made more out of obligation then intrinsic desire—another recipe for failure. Yet, the new fiscal year serves as a great boundary to measure progress, so I’m joining the herd and making some New Year’s Resolutions of my own. New Year’s Resolutions, alone, aren’t enough, because most people have no tangible plan to help them achieve their goals. To mitigate that problem, I’ve listed a clear-cut plan for each resolve. Lastly, we need to clearly define what success means. Saying I want to lose weight is too vague since, technically, losing 3 pounds fulfills that resolution; hence, setting concrete goals is essential. Here are my New Year’s Resolutions; my actionable plans for success and how I define that success. While, extrinsically, I’d like to hit my revenue goal, what’s much more important is the lifestyle I can create through the business. It’s not enough to merely hit the revenue goal if it leaves me a slave to the business for 60 hours a week. My goal is complete automation: Whether I’m on a beach in Thailand or grinding at home, I want to wake up everyday and make X amount of money through sales. I’m obsessed with helping others improve at poker, and the way to achieve my revenue goals is to provide the best product that helps the utmost amount of people. In short, I believe in creating win-win relationships with my customers so everyone crushes! Taking a trip for Christmas in 2018 and hitting my revenue goals—doing it without working, while on vacation—through automated sales. This is arguably one of the hardest to achieve, since my definition of a detox vacation means no technology. I haven’t been completely “off the grid” for more than a week in the last five years, so taking two planned trips, ironically, leaves me feeling rather anxious. Still, I know this is something I need to do to internally reconnect and recharge; for 2018, I’m committed to making it happen. Schedule my trips—on the calendar—well in advance. For the entirety of each vacation, I stay away from electronics. That equates to reading just over two books per month. I finished 2017 with an embarrassing 7 books, so spending more time reading is something I’m committed to improving upon in 2018. I feel this is an extremely lofty goal, but I’m excited at the challenge. I’m attacking this goal head on, because reading is one of the best ways to learn. The fact that we live in a society where someone can dedicate her entire life to a task, condense it into a book, and sell it for $25, is truly wonderful. Consequently, I should take advantage of this incredible opportunity and read more often. Block time out in my calendar to spend at a coffee shop, on a daily basis, dedicating time to reading. Listen to audiobooks while driving. Take a course in speed reading. Read 25 books by the end of 2018, with 5 of those strictly for pleasure (i.e. novels). I’ve already mentioned that I think crypto currency (more specifically blockchain) is going to revolutionize the way we operate as a society. I’ve recently begun putting my money where my mouth is and investing in the crypto market. I believe the experience I have as a poker player will help me immensely as many of the skills are highly translatable to crypto: bankroll management, betting on your intuition and separating the facts from the noise. I’ve allocated a separate bankroll to crypto and I have lofty goals to 5x that money this year, while still practicing proper bankroll management principles. Do hours of research, reading white papers, reviewing the teams and discovering the most profitable crypto ICOs. Create a diverse portfolio and use my bankroll management system to practice proper risk management. 5x my original investment by the end of the year. I’d love to hear about your New Year’s Resolutions, too. Please share them below. I am not into Bitcoin and so on but i wanna learn about it, perhaps go further. I am mostly focus on reading books now, i just bought 7 books today… I never read books until i was 21 one man… it was painfull for me to read, not able to focus and having headache while reading… that was me, i am not lying… Then i met my mentor and he introduced me to reading slowly… just like that i learn to crawl, then walk. I read like 10-12 years in 2+ years but last year i read more books than in all my past years combined. 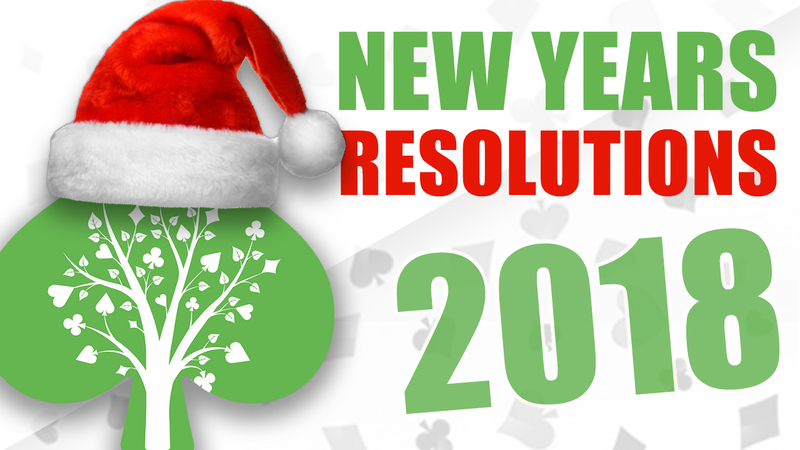 So i am inspired by you and gonna make that resolution plan in a better way. btw i am counting numbers like your post 2017 by the numbers, i love it!